Time - Our traditional worship service starts at 8:30am and typically ends by 9:30am. Atmosphere - The first service is more quiet and reflective. An order of worship is followed from the bulletin with announcements, hymns, spoken responses by the congregation, a message, Bible readings, songs by the choir, prayers, and a departing blessing. Some responses are sung. Those familiar with the traditional liturgical Lutheran orders of worship would describe our "traditional" service as more of a blended style but will be able to recognize the invocation, confession, absolution,etc. easily. Attire - Come as you are! You'll find jeans and t-shirts to suits and ties on those attending first service. Our pastor and other people helping with first service do wear traditional white robes during this service representing how our sins are covered and forgiven through Christ. Music - The service blends old favorite hymns such as "Amazing Grace", "I Know My Redeemer Lives", and "A Mighty Fortress is Our God" with some newer favorites such as "White as Snow" or other Maranatha selections. Music is usually presented on organ or piano, and other instruments on occasion. Most Sundays the choir also blesses the congregation with music that allows one to reflect on the message! Other - A free will offering is collected each Sunday during both services and communion is offered during second and fourth Sundays of the month. 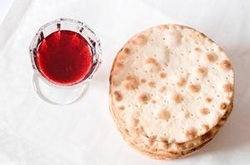 If you are planning visiting our church, please, read more about what we believe about the Lord's supper.